Wordless Wednesday: Love is in the Air! Hello everyone, and welcome to this week’s Wordless Wednesday Blog Hop entry! My friend Deb from Focused on the Magic always does an outstanding job with this series, so it is a real treat to me to bring you some of my favorite photos. This week the theme is appropriately named “Love is in the air” in honor of Valentine’s Day coming up on Thursday, so I thought I would share some of the photos that really captured what love is about — at least in that particular shot! 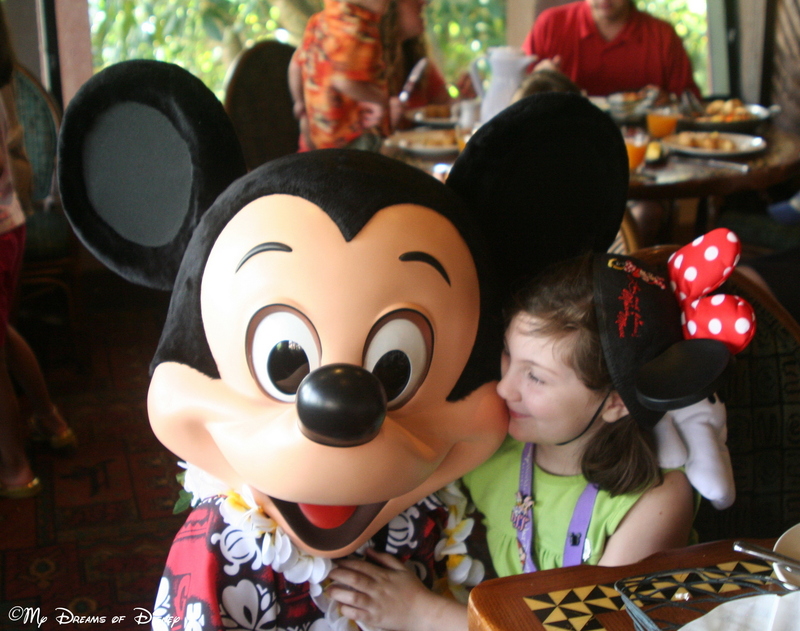 The first picture I’m sharing is of my daughter Sophie next to Mickey Mouse over at ‘Ohana when we had breakfast there. The look on Sophie’s face says it all in my opinion — she loves her some Mickey! 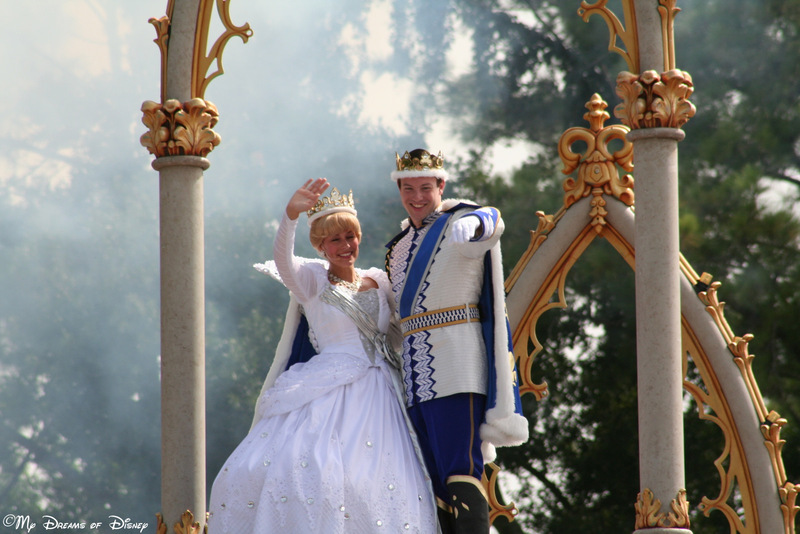 This next photo was taken in 2006 when Cinderella and Prince Charming celebrated their wedding vows in front of Cinderella Castle! 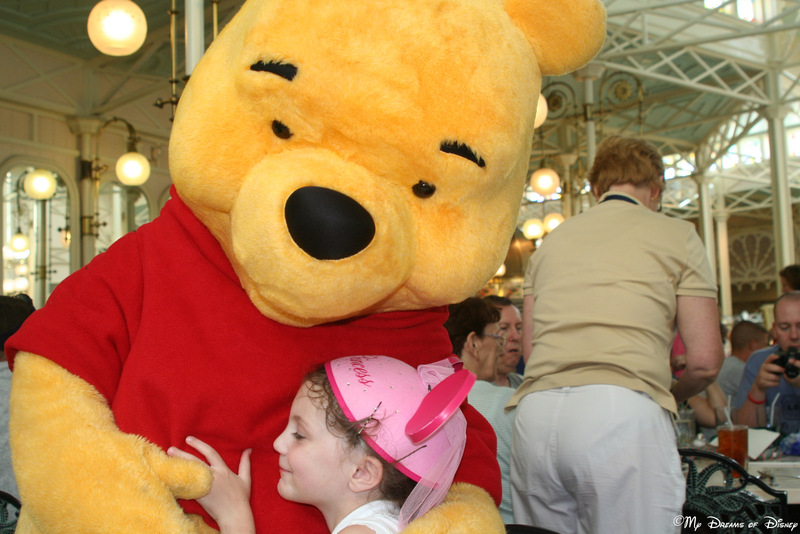 This next photo is of Sophie and Winnie the Pooh at the Crystal Palace. The contentment on Sophie’s face is purely visible, and at that moment, there is no place she would rather be on God’s Green Earth! After all of these photos, though, the one photo that sums it all up better then any other could is the one that I’m saving for last. 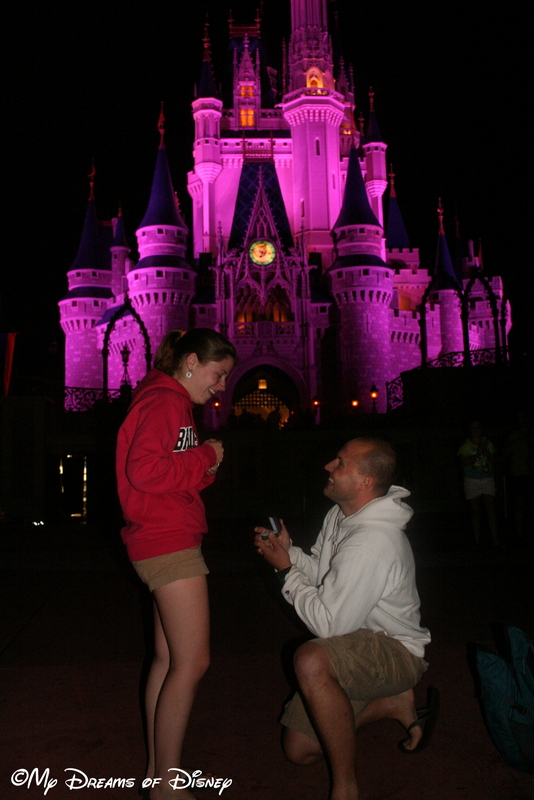 It was June 11, 2012, at 12:52 AM, when my new nephew Shane proposed to my niece Stephanie in front of Cinderella Castle. Many words have been written about this magical evening, but in many ways, it is the picture itself that does all the talking! Thank you for stopping by and visiting! I hope you have enjoyed this look down memory lane with us, now don’t forget to go see the rest of the entries as well! Just click on the button below to see all the entries this week, and thanks! Surprising Sophie at the Grand Floridian! Fantastic photos capturing love all around Disney. You are right the proposal photo is beyond magical. Great shots but wow, love the proposal! Good work, Shane!! You definitely can’t say anything more about “Disney Love” than the proposal picture does. What a fantastic moment, although your daughter looks every bit as happy in Pooh’s arms as your niece does to be proposed to. A castle proposal! How special! Congratulations to your niece! Love all your ” Disney Love ” pictures but that castle proposal is definitely the most romantic I’ve ever seen! Thanks so much for sharing and for joining in on the hop today! Happy Valentine’s Day! Wonderful proposal picture! I also really like the picture of Cinderella and Prince Charming in their wedding gear, I’ve never seen a picture like that before! The castle proposal brought tears to my eyes. Just breath-taking. And Sophie snuggled up to Pooh is beyond adorable. Great pictures! The proposal in front of the castle is so romantic but my favorites are the character pics with Sophie. I love the expressions on her face – pure bliss! Those are awesome memories, Mike!!! What great pictures! I love the one of the proposal!! Previous Post: Valentine’s Day Ideas for Romance at Walt Disney World! Next Post: Magical Blogorail Red – A Few of our favorite Disney Things!